Ueno Park is a public park in the Ueno district of Tokyo. 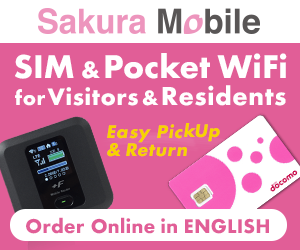 The park is famous for its many museums and art galleries, as well as for being a very popular location for cherry blossom viewing in the spring. The atmosphere is very upbeat and lively with many street performers, festivals and people enjoying nature. While some parts of the park are not wheelchair accessible, it is still a great place to visit if you have a disability. Among one of Japan’s first public parks, Ueno Park was established in 1873 on lands formerly belonging to the temple of Kan’ei-ji. The temple was nearly completely destroyed during the Boshin Civil War at the beginning of the Meiji Era. The temple was modeled after Enryakuji Temple that overlooks Lake Biwa in Kyoto. Imitating Lake Biwa, Kan’en-ji features a large pond with an island in the middle. The island features a small temple hall dedicated to the goddess of Benten. 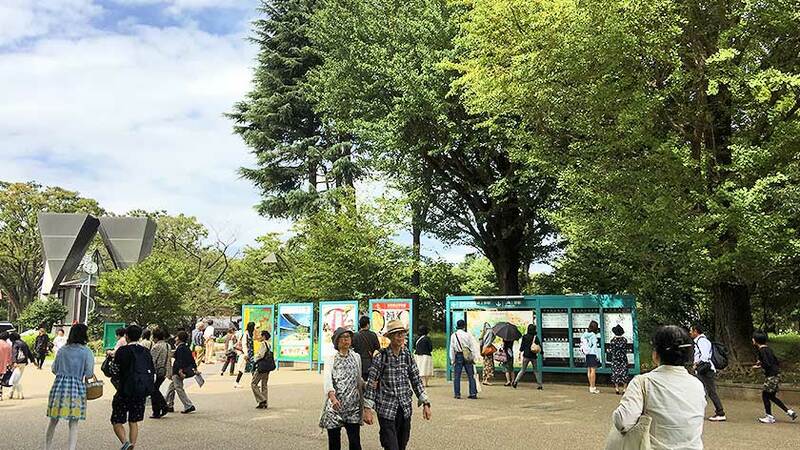 The northern part of the park has over 8,800 trees (including 1,000 cherry trees lining the main path), open green spaces, and many museums including the Tokyo National Museum, the National Museum for Western Art, the Tokyo Metropolitan Art Museum and the National Science Museum. 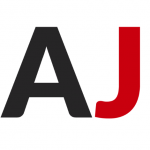 It is also home to Japan’s first zoo, Ueno Zoo. In recent times the park and its attractions have drawn over ten million visitors a year, making it Japan’s most popular city park. Ueno Park is most easily accessed from JR Ueno Station’s (station map) “Park Exit” which is wheelchair accessible but does have a slightly steep ramp. 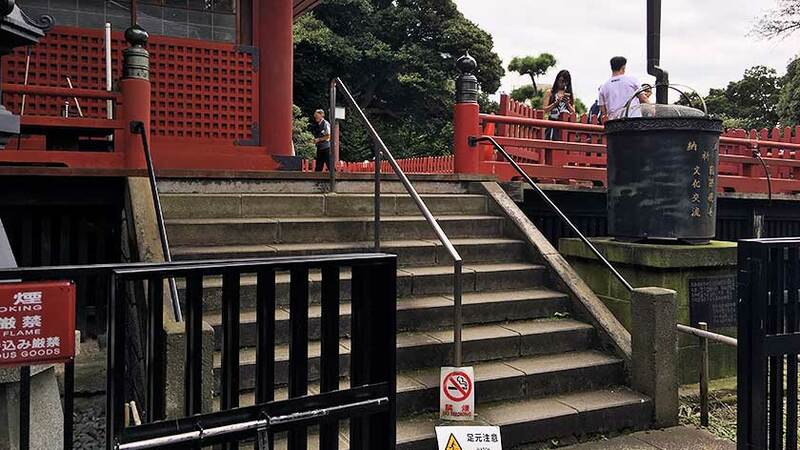 Ueno Park is fairly wheelchair accessible, but not perfect. 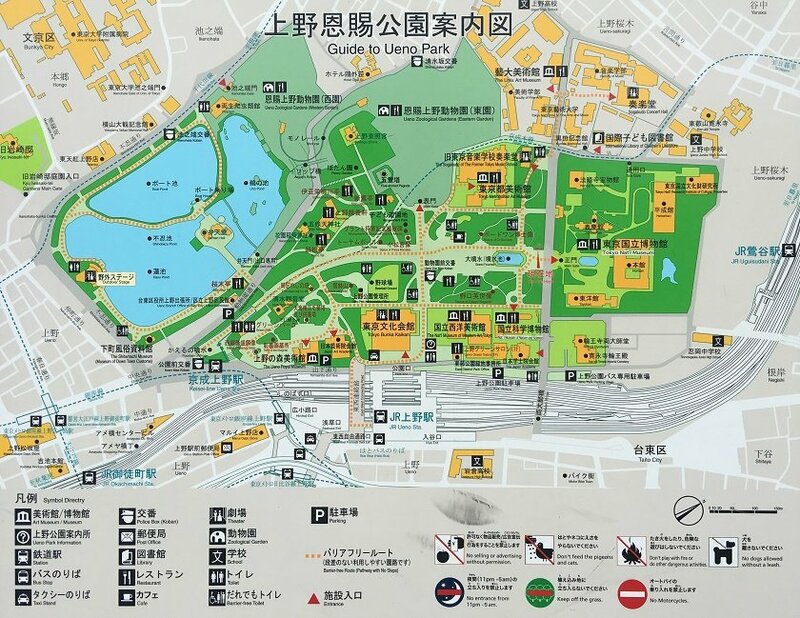 The park is generally divided into a northern section (near JR Ueno) with museums and greenery, and a southern part with a large pond and the Benten Hall. To go between sections, there are stairs, as well as two access roads. The roads are a bit steep and may want to be avoided by manual wheelchair users. If you avoid the roads, you can still get from one section to the other by going around the perimeter. There are maps around the park with a dotted line indicating a suggested wheelchair accessible route. 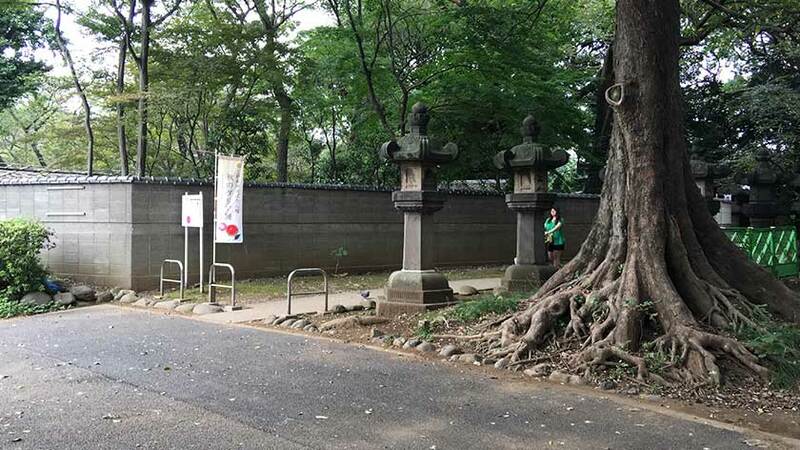 The museums that are located in and around Ueno Park are wheelchair accessible, though due to the age of some of them, adaptations that have been added to the buildings sometimes require following a different route than other visitors. Several of the temple buildings spotted across the park are inaccessible due to steps and architecture. 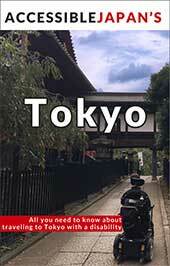 These include the Hanazono Inari Shrine and Kiyomizu Kannon Hall. However, approaching Kiyomizu Kannon Hall from the top of the hill at least allows for some access to the building. The Toshogu Shrine has steps at the front access but you can enter from the left (when facing the main entrance) where there is a small path. 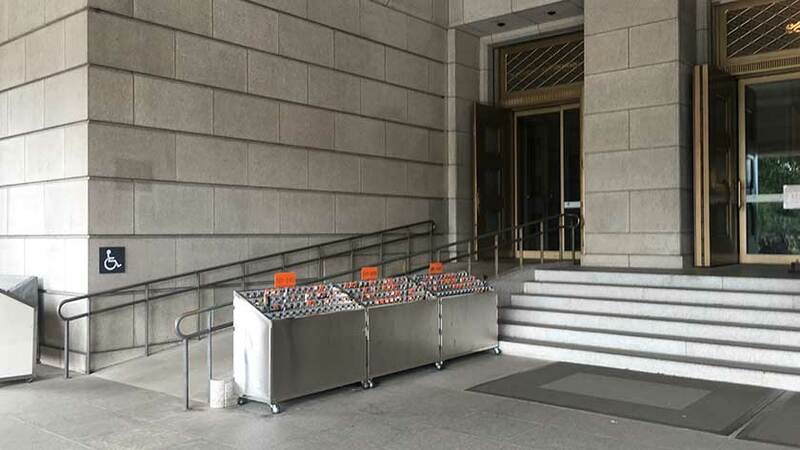 It is possible to get as far as the main hall, but the path is made of large stone slabs and can be a bit uncomfortable in a wheelchair. In the southern part of the park, Benten Hall is located on a small island in Shinobazu Pond. While the map park maps indicate it cannot be approached face on, it actually can be. However, expect some gravel and stone blocks. 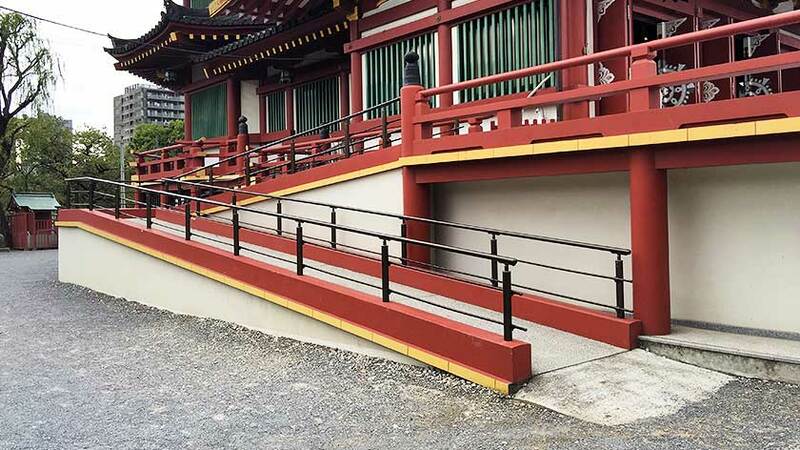 There is a ramp on the side of Benten Hall allowing access to the main sanctuary. In addition to the toilets located within museums, there are several wheelchair accessible toilets located throughout the park and indicated on park maps. As with most park toilets, they are spartan and not terribly clean. 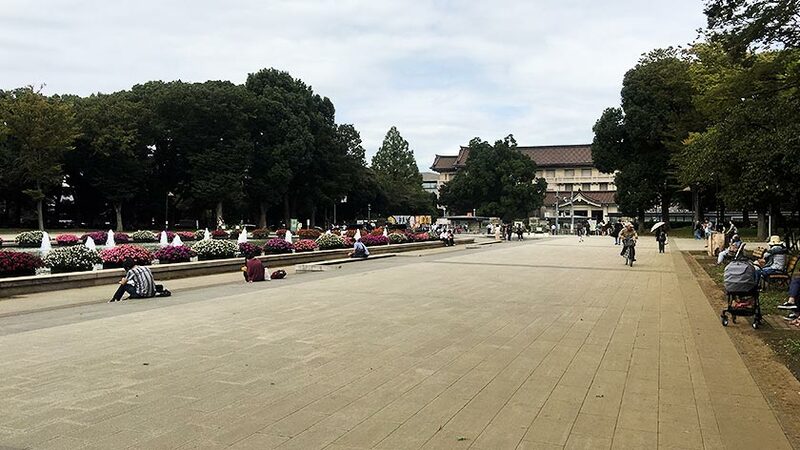 While there are a few places that are not wheelchair accessible, Ueno Park is definitely a great place to enjoy history, culture, entertainment, and a bit of nature within Tokyo. There is a lot of walking, but also places to rest. 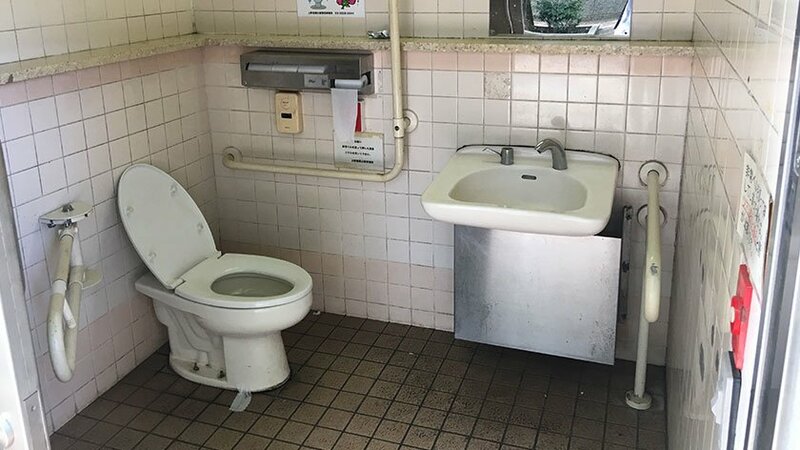 The toilets are not great, but they do exist. For those going to enjoy the cherry blossoms, be warned that the popularity of the park makes for a very crowded and noisy atmosphere that may be overwhelming for some people.